It looks like my orna-mints (mints, haha, get it?) got me in the Christmas mood after all. Last year I made dresses for each of my cousins, all girls, all under the age of 10. They really liked them, although I think one of the dresses might have been a tad tight. I’m not sure how much wear they got out of them ’cause kids grow so fast but whatevs. I’d rather make clothes than try to buy princess toys. One of my cousins even asked if I could make her a pageant dress (apparently they do pageants now, I’m going to try not to think of Toddlers and Tiaras…) but I’ll have to save that until later. That would require a lot more work and fitting. This year I made it easier on myself. I made all three dresses from the same pattern, Kwik Sew 3935. One problem with not having my own kids is that I am lacking in models. So if you want to see what this dress ought to look like on real children you can see the Kwik Sew website. I traced each pattern, ’cause I’m a tracer now, not a cutter, and also ’cause I didn’t want to buy three copies of this pattern… ahem… in a M, S and halfway between a XXS and XS. And I made every dress out of knit which is good ’cause I didn’t have to finish any edges on the elastic casings. The green sparkly knit is from Joann or Hancock, can’t really remember. The other two are both from Girl Charlee. I thought this design was pretty cute. There’s elastic in every opening and in the kangaroo pockets. It has raglan sleeves and a slightly hi-lo hem (why, how trendy). The pattern also comes with some leggings. Obviously it’s going to be difficult to judge the fit without the girls wearing them but these dresses are loose enough that I probably won’t have to worry about them being too small. Plus, as they grow taller they can use these dresses more like tunics and wear them with leggings or jeans. 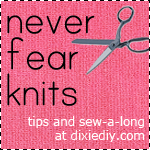 Are you sewing any holiday presents this year?